A few weeks ago there was some rumor that nuclear missiles disappeared from a military base. At the same time Senator Lindsey Graham made some curious remarks about a missile strike in South Carolina. Fascinatingly curious. 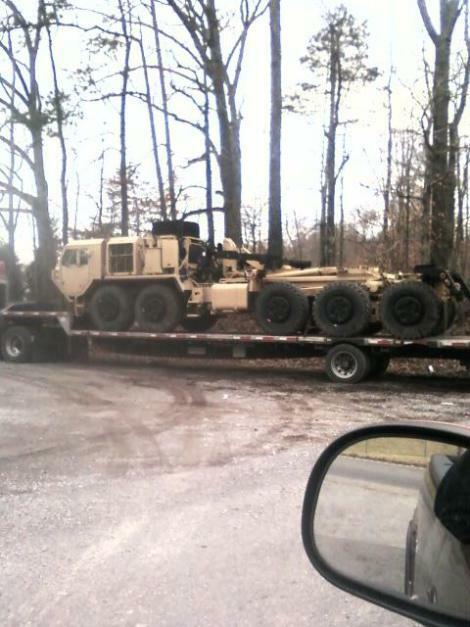 What the heck are these missile launcers doing in Tennessee? I was on my way home the other day, when I received a phone call from D1969. D1969 was on his way home traveling on a lonely back road in the Southern part of Tennessee when he came upon this truck on the side of the road. He slowed down but continued on and called me. I asked him if he took a picture of it, he said no but then turned around to take one. After taking the picture, some guy comes flying up in a Piece of Crap GMC and tried to bully D1969, wanting to know what he was doing, why he was there and so on until he noticed D had a Beretta in plane sight. Then this guy’s tone changed, he started being nice but this isn’t the end of the story.